I spent this past winter producing, directing, and shooting a modest budget, super-mobile television program featuring the beautiful western Caribbean country of Belize. (I know – life is tough!) For those who don’t know, Belize is a small country nestled just down the coast from Mexico’s Yucatan Peninsula, bordered by Honduras to the south and Guatemala to the west. The country is naturally tropical, boasting the world’s second-largest barrier reef, a myriad of historic Maya sites, a melting pot of races and cultures, and a vast variety of plant and animal life. It’s absolutely stunning what a wide array of things there are to document in Belize. 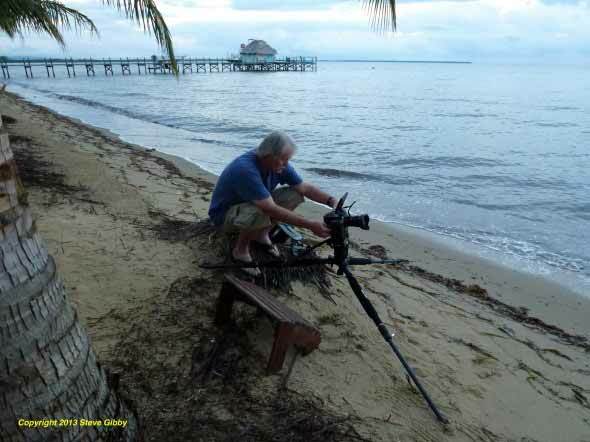 If you can’t find dynamic images to film in Belize, you’re definitely in the wrong business. There seems to be no end to the natural wonders to document in Belize. We found this waterfall way out in the far west of the country, by the Guatemala border. 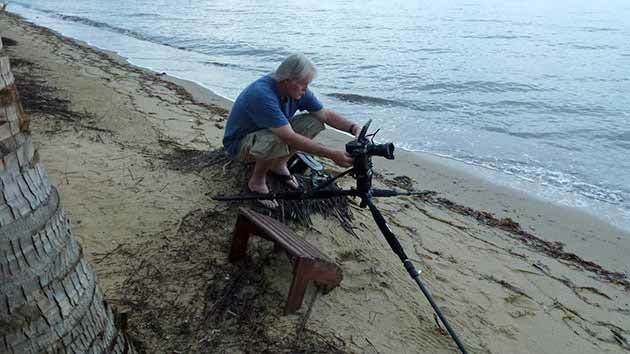 Setup shown is the Miller Compass15 tripod with spreader-less CF legs, supporting the Canon XF100. I also shot with the Red Epic at that location. Nothing quite like working in a stunning sound spa for the afternoon! Real mobile outdoor productions are always deeply challenging. Crews end up slogging around with equipment, dealing with changes in weather, overcoming constant technical issues, caring for and guarding equipment, backing up and storing footage, and dealing with a seemingly endless parade of problems to solve. My small, mobile crew and I needed to be constantly traveling to new locations in Belize. I used a wide variety of camera systems, including a small-form-factor Red Epic (with Canon lenses) for slow-motion and beauty montage sequences, a Canon XF100 for interviews and general use, a Canon 5D Mark III for time lapse and behind the scenes stills, and a GoPro Hero 3 Black Edition for POV sequences. I was one of the very first ground-floor adopters of Red cameras, so I definitely wanted and needed some high-frame-rate, high-resolution images for the “eye candy” of the program — slow-motion sequences, mood montages, etc. The Epic is tiny — the body weighs just 5 pounds — and for this type of mobile production my setup was about as light as you can make an Epic, including Canon-mount L-series Canon zooms (16-35, 24-70, 70-200), a Red 5-inch touchscreen LCD with Hoodman hood, a Red Side Handle, several small Redvolt batteries (mount inside Side Handle), and a rain cover. The Canon XF100 shoots in a broadcast quality bitrate of 50 Mbps in a 4:2:2 color space. It’s tiny, has dual XLR inputs, uses dual CF cards, and is a power miser. With it, I used a Sennheiser ew 100 dual wireless mic system, a Canon Wide Converter, a Sennheiser ME66 short shotgun, and, when needed, a small Litepanels MicroPro. Interviews and general use shots were fast and easy to get with this setup. With the 5D for time-lapse and behind-the-scenes stills I used the same Canon L-series zooms I used on the Red Epic: 16-35 f2.8L II, 24-70 f2.8L II, and 70-200 f2.8L II. Using the same lenses for the 5D and Epic kept my backpack lighter while still giving me the excellent image quality I wanted. The GoPro Hero 3 Black Edition is an amazingly capable little camera. At one time or another in Belize I used the Hero 3 on about every type of accessory out there — poles, housings, hand grips, mini-dollies, suction cups, etc. Those types of shots are always the frosting on the cake for mobile adventure travel and alternative sports productions, which have been a large part of my career genres. 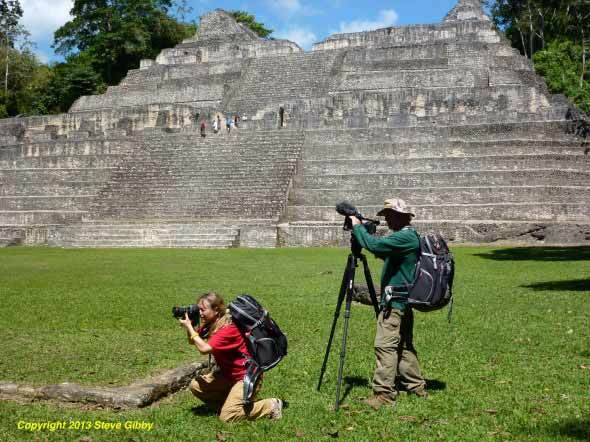 Belize is full of incredible Maya sites. 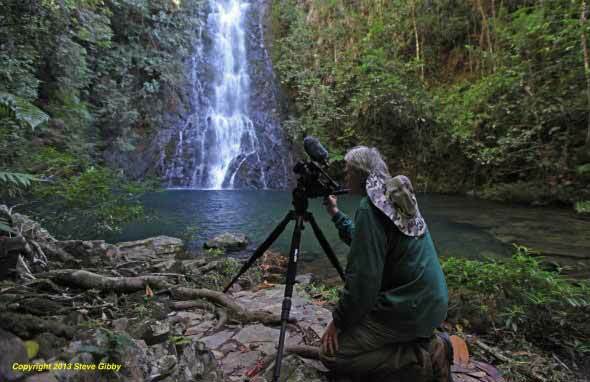 This day we documented the exquisite Caracol site in the Cayo District. Crewmember Pam shot with the 5D while I alternately shot with the Red Epic and Canon XF100 on the Compass15. A hauntingly beautiful location for sure. For this type of production, very good camera support is absolutely critical. My Epic, XF100, and 5D setups were all lightweight, so I really needed a lightweight tripod system with a smooth fluid head to support all three cameras alternately. My solution — and it turned out to be a very good choice — was a Miller Compass 15 head with Solo 2-Stage Carbon Fiber legs (System 1833). The mobile backpacks I chose for the crew and myself were Clik Elite Contrejour 40 and Contrejour 35, which also turned out to be a very good choice. More on that later. The Compass 15 head performed amazingly well, with its five positions of drag (and zero position). When previously using some other manufacturer’s, heads I’ve found that the combination of heat and humidity can sometimes affect head performance — but not this head. Throughout those difficult conditions in Belize, the Compass 15 head performed very well, allowing smooth pans and tilts, quick and easy adjustments, and shots that came out exactly as I envisioned. The payloads of my camera systems in Belize ended being on the low end of what the Compass 15 is rated for. Miller says the head has a range of 4.4 to 22 pounds. My streamlined Red Epic setup weighed in at around 10 pounds, the XF100 setup about 6 pounds, and the 5D setup around 4 pounds. Changing cameras throughout a shooting day required me to quickly “re-tune” the Compass 15 head, re-setting the counterbalance (four selectable steps on the head), and also “tweaking” the pan-and-tilt drag for just the right amount of resistance. I found the Compass 15 head really easy and fast to re-set. All three rotating levers are large, easy to find, and quick to adjust. Quick adjustability of everything is way critical for mobile adventure travel, action sports, and wildlife production. Early-morning sunrise filming with a super-lightweight Red Epic setup with Canon 16–36, supported by the Compass 15 in low-level mode. I really love spreader-less CF legs for mobile production. They enable high, normal, and low shots quickly. The Solo 2-Stage CF tripod turned out to be a great choice for not just the head and its payload, but also for the real mobile style of outdoor production. I constantly needed to shoot from a variety of camera heights and angles. The two stages were easy to adjust with a twist of the wrist. With a quick lifting of a tab at the top of each leg, that leg could be extended or retracted. The legs also enable a wide range of head plate heights, from a “spiderpod” low of 9 inches all the way up to 64 inches. The CF construction makes the legs super-light, but strong. I found I really liked the carrying strap, which simply clips onto both ends of the legs, making it easy to sling the whole head/legs combo over your shoulder and hike to the next setup location. Miller says the total weight of the Compass 15/Solo 2-Stage CF system is 14.8 pounds, but after hiking with it slung over my shoulder all winter in Belize I can say that to me it felt lighter than that. I never felt like it was something heavy slowing me down, and I was constantly out on the barrier reef islets (cayes), slogging through steaming rainforests, climbing up and down Maya ruins, and filming the people of Belize in their diverse lifestyles and occupations. The Clik Elite Contrejour backpacks are the most comfortable packs I’ve ever used, bar none. In this type of run-and-gun production, a pack needs to stay on your back continually. Comfort is critical. These Clik backpacks are ergonomically molded to shoulders and back, load from the back, are airline carry-on legal (we carry on all cameras), have lots of compartments, and, to deter theft, they look just like normal hiker backpacks. When doing production in many areas of the world it’s a real good idea to be low-profile with equipment and crews. The more you can look like a normal tourist, the better. Belize has a 180-mile barrier reef, dotted with scores of beautiful tiny islands (cayes). I'm using the XF100 on the Compass15. A few minutes to sit down, grab some shots, and reflect on the Caribbean beauty. The Belize production was amazingly mobile, technically difficult, and physically hard. Needing to constantly pull out a different camera, mount it, get the needed shots, then move and/or change to another camera is not only artistically and physically challenging, but it demands a ton of thought and planning. But I’ve done huge amounts of this type of production around the world throughout my career, so I knew what I’d be up against. The bottom line is that the Red Epic, Canon XF100, Canon 5D, and GoPro Hero 3 Black Edition, Miller Compass 15/Solo 2-stage CF combo, and Clik backpacks danced together extremely well, and thus helped tremendously in making the whole mobile experience much more workable and enjoyable. Beyond that, the real bottom line is that those equipment choices really helped enable me to absolutely nail some very dynamic images of Belize! 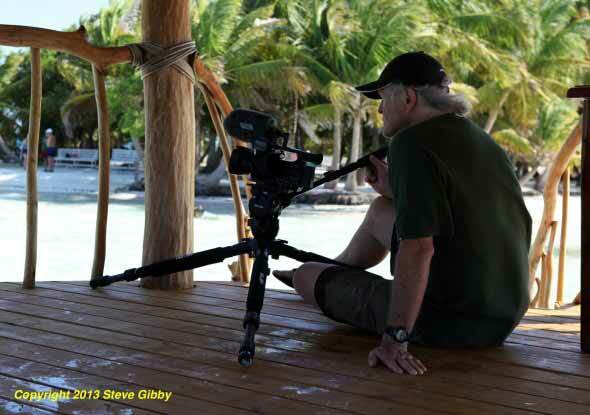 Steve Gibby is a multiple Emmy Award winning producer, director, DP and cinematographer who has contributed to several hundred national television programs that aired on 18 different broadcast and cable network channels.